Any weekend is a great weekend to visit the Ely Stage Stop and Country Museum in Kelseyville, but July 6 is the next First Sunday Fiddlers’ Jam at the museum. What a great way to wrap up the July 4th weekend. Enjoy great Americana music and all of the latest museum acquisitions and displays. You can’t miss us now that we have our new beautiful sign on the property. 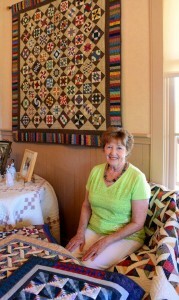 A gorgeous quilt display loaned by Wilma Taylor continues to be shown in the main house through June and July. Taylor hand quilts her “minis” (small quilts) as she loves to do the handwork herself. The quilts on display are just a sampling of the many quilts she has made for display in her own home. Taylor teaches classes at Kerrie’s Quilting in Lakeport and at the Senior Center in Middletown. July’s jam session will give attendees a chance to sample a Springhill organic line of flavored cheeses. Locally made by Petaluma Creamery in Petaluma, the cheeses will also be available for purchase the day of the jam. The fun begins at the museum at 11:00 a.m. with the Fiddlers playing in the barn from 12 noon through 2 p.m. Donations benefit the Ely Stage Stop and the Old Time Fiddlers Association. This free, family friendly event can be enjoyed by all, young and old alike. Bring a picnic lunch to enjoy on one of our beautiful picnic tables. Buy tickets for the next table to be raffled. Enjoy the music with beverages and tasty treats provided by the docents. Bring your own wine and sip it in Ely Stage Stop wine glasses that are available for purchase. Come ready to clap your hands, tap your toes, and get up and dance!